Thailand’s Prime Minister has focused on Royal Rain Making as a way to reduce the amount of particulate matter or PM 2.5 in the air above Bangkok and its vicinity with the Pollution Control Department (PCD) planning to employ water spraying drones as part of its control efforts. A worried Pollution Control Department (PCD) and City Hall are considering declaring Bangkok a “pollution control zone” after haze in the capital worsened on Monrday. Over the past year, 129 marine animals from endangered species have been injured or killed by sea garbage in Thai waters, which means one has been tortured or died every 68 hours from ingesting our rubbish. A surge in the baht is adding to the challenges facing Thailand’s trade-dependent economy this year as exports decline. Foreign children arrested for entering the country illegally with their parents will no longer be held at the Immigration Bureau’s detention centre while they are waiting to be deported, Deputy Prime Minister Prawit Wongsuwon said on Monday. Several flights could be delayed as Don Mueang Airport closes portions of a runway next week for maintenance. Rival groups held demonstrations in Thailand’s capital on Saturday, with hundreds of people demanding quick elections to end military rule and a much smaller group of pro-junta supporters saying it was too soon for a vote. Krungthai Bank has projected the Thai economy will grow at a rate of 4.1% this year, expressing confidence that the kingdom will see an influx of foreign capital once there is more clarification on the election date. SET-listed commercial banks posted a 8.2% rise in their unaudited consolidated net profit for 2018, with most of them setting aside lower impairment charges that cancelled out the impact of waiving digital transaction fees and some recording extra gains on investments. Thai Prime Minister Gen Prayut Chan-o-cha chaired a meeting with the National Land Policy Committee, instructing all to create understanding about appropriate land use. Wild elephants are believed to have pulled a man from a small hut in a pineapple field and stomped him to death. On a television set in a grim, overcrowded Bangkok detention centre refugees closely followed Saudi woman Rahaf Mohammed al-Ms Qunun’s quest for resettlement, as the 18-year-old asylum-seeker’s case spurred hopes of a major policy turn from Thailand — a country that does not recognise refugees. The Securities and Exchange Commission (SEC) is demanding that three offenders, including billionaire Prasert Prasarttong-Osoth, pay civil fines worth a combined 499.45 million baht within 14 days or face legal proceedings by public prosecutors. Thailand will make a bigger push to drive the region’s move towards Industry 4.0 during its chairmanship of the Association of Southeast Asian Nations (ASEAN) regional grouping this year. Thailand’s Deputy Prime Minister, Gen Prawit Wongsuwan, affirmed Thailand’s stance against detaining foreign children in immigration rooms while awaiting deportation, in accordance with the Convention on the Rights of the Child. The Tourism Authority of Thailand will host the 39th edition of Thailand Tourism Festival at Bangkok’s Lumpini Park from January 23-27. This year the festival features five ‘tourism villages’ representing different regions of Thailand plus two additional zones of activity. Polluting vehicles will be removed from the road as potentially harmful ultrafine particles again reached unhealthy levels and spread to wider swaths of the metropolitan area, officials said Monday. Security walls, concertina wire and security cameras will be installed by the government at Buddhist temples throughout the Deep South after two monks were killed in an attack. 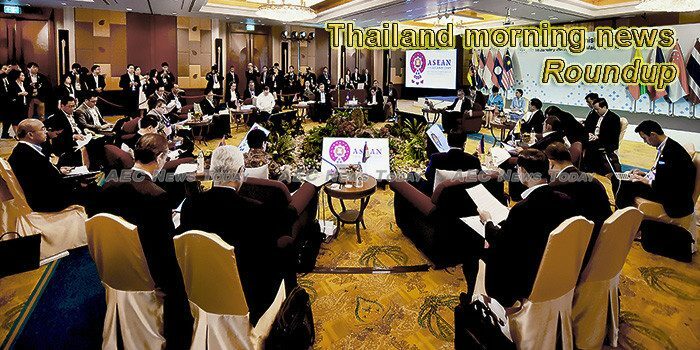 The Islamic Bank of Thailand (IBank) has been given the green light on to exit its rehabilitation plan by the State Enterprises Policy Commission, thanks to the bank’s improving operating performance. Thailand’s Fisheries Department expects a bright future in the local fisheries industry after the European Commission took Thailand off its group of “warned countries” in recognition of its progress in tackling illegal, unreported and unregulated (IUU) fishing. The Marine Department has unveiled a new plan for Pattaya to safeguard tourists who engage in water activities at this beach resort city. PHOTO: Thai Whales Over the past year, 129 marine endangered species in Thailand have been injured or killed from sea garbage, which means every 68 hours one of them has been tortured or died from ingesting our rubbish. Crime-suppression police on Monday raided and searched a house in Bangkok’s Bang Phlat district under a court warrant on suspicion that it was being used as a venue to operate 818Kiss, an online gambling website. The son of one of three missing republicans said Monday that police have concluded that a mutilated body found in the Mekong River was his father. The Hua Hin municipality is sterilising even more macaques as their population has grown to about 3,000 despite past desexing efforts. How much heroin can you smuggle in eight (car) shock absorbers? Apparently close to 4 kilograms. A joint Thai-Australian drug suppression operation called Taskforce Storm has yielded results and arrested two transnational heroin smugglers. A Border Patrol Police Lance-Corporal wanted for shooting dead a local councillor’s son in Phuket early Saturday morning has presented himself to police, Wichit Police confirmed today (Jan 21). The leader of a weekend rally said Monday his group was not involved in the assault of a pro-democracy activist. The Cabinet has extended the second phase of its welfare measures by another six months along with eight urgent programs in the upper northern region.